Hip Hop culture is a way of life-- a way of thinking and creating. a means to organize and create social change. Political. Hip Hop is NOT dead. Hip Hop is NOT to blame for societal ills. Hip Hop is a movement. 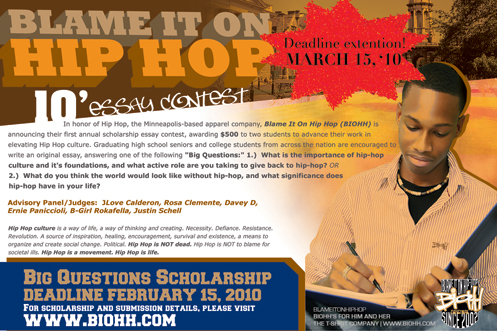 In honor of Hip Hop, the Minneapolis-based apparel company, Blame It On Hip Hop (BIOHH), is announcing their first annual scholarship essay contest, awarding (2) $500 scholarships to two students to advance their work in elevating Hip Hop culture. Graduating high school seniors and college students from across the nation are encouraged to write an original essay, answering one of the following "Big Questions:" 1) What is the importance of hip-hop culture and it's foundations, and what active role are you taking to give back to hip-hop? or 2) What do you think the world would look like without hip-hop, and what significance does hip-hop have in your life? Submissions will be accepted through Monday, March 15, 2010. Essays can be no more than 1,000 words, double-spaced. Students are encouraged to share personal experiences and narratives, as well as any relevant supplements: rhymes, poems, photos, sketches video (links only, please) etc. Be creative! Two winning essayists will be awarded $500 to be applied towards tuition, books or living expenses. Contest is open to high school seniors and college students nationwide, who will be accepted or enrolled in an accredited College or University for the 2010-2011 academic year. Blame It On Hip Hop has carefully selected an advisory panel of distinguished Hip Hop legends, artists, activists and academics. They will score all eligible contest entries based on the following criteria: Level of knowledge, understanding and involvement in Hip Hop culture (40%), Originality and creativity (40%), and Flow, style, grammar and writing skills (20%). JLove Calderon is an author, educator, activist, working passionately on social justice, race, and gender issues for over 15 years. In settings that range from hip hop ciphers to the college classroom, JLove is widely respected for her advocacy of “truth, love, and freedom“ for everyday people, especially young people, women and girls, and lovers of hip hop culture. Rosa Clemente is a Black Puerto Rican grassroots organizer, hip-hop activist, independent journalist, and entrepreneur. She was the vice presidential running mate of 2008 Green Party Presidential candidate Cynthia McKinney in the 2008 U.S. Presidential election, and is currently hosting a new radio show, "Hip Hop State of Mind" on WBAI 99.5FM, NYC. Davey D is a Hip Hop historian, journalist, deejay, media and community activist. Currently he's the webmaster for what is considered one of the oldest and largest Hip Hop sites on the web, Davey D's Hip Hop Corner (www.daveyd.com). The writings on his website are frequently referenced and quoted by journalists, scholars and professors and fans from all around the world. Ernie Paniccioli is a legendary Hip Hop photographer and author of "Who Shot Ya Three Decades of Hip-Hop Photography." Regarded by most to be the premier “Hip-Hop photographer in America," Paniccioli first made his foray into the culture in 1973 when he began capturing the ever-present graffiti art dominating New York City. B-Girl Rokafella is a multitalented artist- a veteran breakdancer, visionary, teacher and mentor touching the worldwide Hip Hop community, she represents the positive image of a woman, confident in both her Puerto Rican and Hip Hop cultures. She is co-founder of Full Circle Productions, a non-profit serving the community with educational performances and multimedia urban-themed performances. Justin Schell is a freelance writer, filmmaker/videographer and graduate student in Minneapolis, working on a book and documentary about immigrant, refugee, and diasporic hip-hop in the Twin Cities. He can be seen across the country as a panelist, documentarian, and videographer at shows and community events. 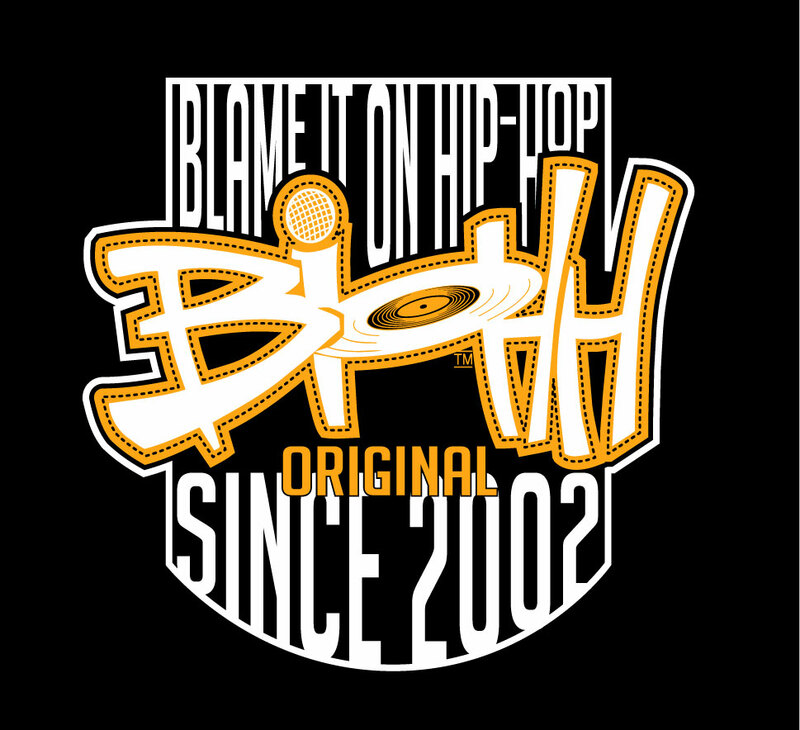 Blame It On Hip-Hop is more than an apparel company selling hot clothes—It is a movement dedicated to fusing three key elements: 1) Highlighting the positive aspects of Hip-Hop, 2) Giving back to the community, and 3) Looking fresh while doing it. BIOHH's mission is to combine colorfully-edgy fashion while facilitating creative conversations and educational opportunity. BIOHH is a social entrepreneurship venture intimately allied with Hip-Hop. They stand behind the idea that people come before product, and their business practices are rooted in the advancement of Hip-Hop culture, so when you invest in BIOHH, you invest in tomorrow's promise. BIOHH strives to make sure the quality of the product compliments the quality of conversations. Join the Movement. Cop the Fashion. Support the Advancement of Hip-Hop culture. Name, address, phone number, email address, the name of your school, and current level of education. All essays must be postmarked by March 15, 2010, or emailed by 11:59 P.M. CST on the deadline date. Winners will be announced in April 2010. Copyright © 2009, BIOHH, Inc.